Lets face it, Monday's aren't exactly the most magical day. In fact, most of the time, they're kind of a stinker. At least for the earlier half. 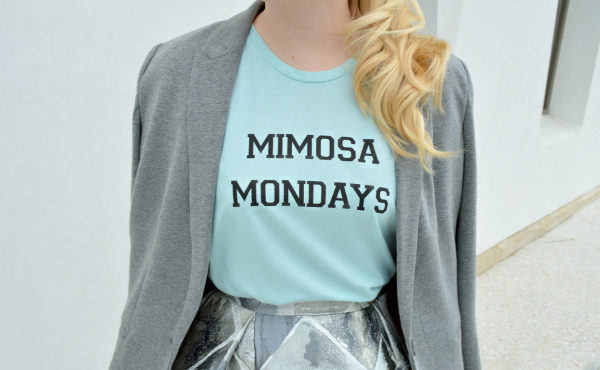 I recently found this Mimosa Monday shirt while browsing Nylon's online shop (orange juice and champagne sold separately) and thought it was the perfect way to soften the first day post weekend blues. For those of you who aren't familiar with Nylon's shop, I highly recommend you check it out. Each of the unique items are loving curated by the Nylon staff, so you can always expect to find a trove of super fun, trendy, and edgy selects. Wow, that skirt is amazing. You look gorg, girl!! Stop being so adorable. I love this outfit. I didn't know Nylon had a shop. I love their magazine. I'll have to check it out. What a beautiful outfit on you, love!! Oh my goodness! Those shoes and that skirt! I am in love!!!! Ohhh, I love your skirt! it is so beautiful! I agree Mondays aren't the best, but you do look like a Princess. I love that graphic tee and fun artsy-graphic a-line skirt. I love the message on the tee. Such a cute outfit, and I love that top. LOVE the color combo!! Such a cute outfit, especially that amazing skirt!! love all the gray tones! I need this t-shirt! You are adorable! Loving the print and shape of your skirt! The shape of this skirt is killer!! That shirt is so cute. I might have to order it for me and my girlfriends. Mimosa's are a weekly tradition for us. You've totally nailed this outfit! Love the way you've styled it! I love everything about this, Anna. Absolutely love love love this skirt!! You look stunning! You look adorable!!! Loving that tee.. I love this top, so fun and the color is beautiful against the grey tones! Such a cute look, especially that you with the ponytail. Cute shirt, love this colour for spring. Great outfit Anna! This shirt would definitely lessen my Monday blues! Great idea to match a simple graphic tee with a blazer and skirt, love it! Just followed your blog, keep up the great work! Beautiful as always, Anna. I really like these two colors together. Love the skirt! You look beautiful as always! The print on that skirt is super gorgeous! Love! You look so chic and stylish. I adore this combo and you did a fantastic job styling. I especially love your silver heels! I love this clutch, so pretty! Wow!! I'm obsessed with this look!! You look so gorgeous!! Such a cute tee- and love the metallic pumps! Wonderful look! I just adore your skirt!! Really fabulous! This shirt is TOO perfect! It definitely helps ease into the week.. Adding it to my wish list ;). Also adore your skirt Anna. Cute grey/ silver skirt. It's so feminine. Also, Love these heels, your legs look amazing! haha LOVE that graphic tee! And its a perfect casual combo to be paired with that gorgeous skirt! Professional photo captured looking spanking to see these guy .